BBC NEWS | UK | Magazine | Can 'naked roads' kill speed? Can 'naked roads' kill speed? Can removing kerbs, traffic lights and signs as part of psychological traffic calming measures really work? Urban planners claim that removing visible road markings, an approach which has been used with some success in Holland, Germany and Sweden, reduces speed and accidents by encouraging drivers to be more considerate to pedestrians. Reports that the technique could be applied to Exhibition Road in west London, the home of the Science, Natural History and Victoria and Albert museums, have been played down by local authority chiefs. But the idea seems to be gathering steam. 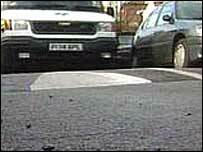 The approach has been tested in Seend, a Wiltshire village, where white lines were removed from the road last April. Wiltshire County Council said accidents in the village dropped by a third and speed has fallen by an average of 5% after the markings were removed. It seems to be just a matter of time before other parts of the country try the idea out. Motoring psychologists and urban planners seem to agree that, overall, "naked roads" appear to have a positive effect on motorists. Urban design specialist Ben Hamilton-Baillie certainly believes the experiment is effective in calming traffic. "This approach draws on behavioural psychology involving the way drivers respond to their surroundings," he says. "It removes the sense of security provided by barriers - such as kerbs, and traffic lights. "Instead of relying on the street system for security, drivers are forced to use their reactions." According to Mr Hamilton-Baillie, the removal of a psychological safety net encourages drivers to exercise caution and restraint. He believes that the lack of clear markings encourages drivers to slow down and mingle with pedestrians, forcing them to make eye contact with one another. Behavioural psychologists believe this eye contact forces people to communicate non-verbally, reducing the breakdown in understanding that causes accidents. The urban planner also dismissed the idea that the approach would be less successful in the UK than other European countries. 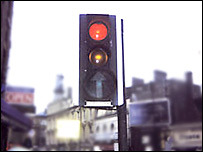 The Transport Research Laboratory (TRL), an independent think-tank, has conducted research into various traffic calming measures, including those with a psychological basis. It has experimented with a number of measures, such as using narrow, winding roads as chicanes and road humps can often prove costly. According to TRL, perceptual techniques - such as unmarked roads - "have the potential for success". However, the body believes that more research is needed before the value of such an approach can be clearly established. Schemes using unmarked roads in mainland Europe have reportedly led to a cut in road accidents. But not everyone is convinced that "naked roads" are effective in reducing speed and accidents in all circumstances. Conrad King, RAC Foundation consultant psychologist, agrees that areas which lack markings reduce speeds - but often to the detriment of other streets nearby. "This system removes key triggers to kid the driver into feeling that he or she is in a pedestrianised zone. If they respond appropriately to the triggers it should remain safe," he says. But the driving psychologist believes the approach would be dangerous if the start of the 'naked road' zone was not marked properly. There is a danger that motorists who were unaware of the initiative might use the unmarked stretch of road as a "rat run", unless the start of the area was clearly signposted, said Mr King. He says: "It would probably reduce speed on that particular road but it would, in all likelihood, build pressure on other roads. "People would slow down on that particular stretch, only to then speed up on other roads to make up for lost time. Consequently, that road might be safer, but overall safety in the area wouldn't necessarily improve." Mr King believes the approach also focuses on motorists and pedestrians at the expense of other road users. In the absence of clear markings, and with slower cars, cyclists would speed up on roads, causing conflicts between pedestrians and people on bikes. The lack of clear markings would also blur the distinction between pavements and roads, making such streets popular with skateboarders and rollerbladers, argues Mr King - raising the potential of minor skirmishes between non-motorist road users.